The flats of Pine Island are miles of shallow water that range from a few inches to five feet deep. 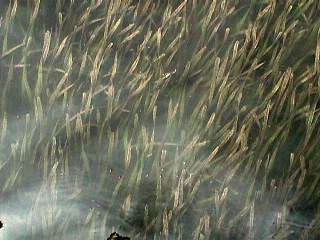 The bottom structure of flats is typically of Turtle Grass and sand. At a depth over five feet the sunlights spectrum fails to penetrate at the levels needed to support turtle grass. At that depth other grasses begin to take over. The flats are a nursery area for a large variety of crabs, shrimp, trout, snook, cowfish, snails, sea horses and an infinite variety of other marine organisms. They are also home to many larger fish such as Redfish, Snook, Trout, Shark, Tarpon and others that feed on all the critters in this fertile habitat. The water color in our flats vary significantly depending upon where you are fishing around Pine Island. In some areas you have near zero visibility due to a combination of factors. A low or high exchange rate with the clear waters of the neighboring Gulf of Mexico. Bay area waters do not get as much of the clear gulf water exchange. High levels of broken down organic content, tanic acid, and algae. This can happen for a number of reasons and for the most part is just part of the natural order of things. High organic content is chiefly from dying vegetation. The brown tanic acid coloring is mainly from the extensive root system of shorline mangrove trees which cover almost every undeveloped piece of shoreline around Pine island. The algae thrive in warm, stagnent waters. Flats in close proximity to that type of habitat will get a much larger influx of algae. In cases where there is heavy street or agricultural runoff the concentrated levels of nutrient runoff can contribute to what are called algae blooms. In general it is safe to say that the flats hold a larger variety of marine organisms than any other single part of the Pine Island ecosystem. Although no single part of the ecosystem can be given all the credit, the flats are clearly a very valuable part of everything that goes on the Pine Island marine ecosystem. All you have to do is get out of your boat and sift around a small area of the grasses to see our point.